Texas LNG Brownsville LLC has announced the start of the regulatory review of its proposed LNG export facility in Brownsville, Texas, following the initiation of the US Federal Energy Regulatory Commission (FERC) pre-filing process. FERC will regulate the siting, construction, operation, and maintenance of the physical LNG terminal and related infrastructure. 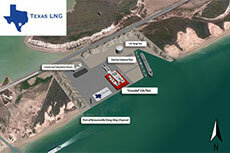 Texas LNG plans to build the LNG project in two phases, each with an LNG production of 2 million tpy. Phase 1 of the project is expected to commence production in 2020, pending final approval from FERC to construct the project. Texas LNG has also executed an amendment to its Option to Lease Agreement with the Brownsville Navigation District in Cameron County to upgrade to a significantly larger and more optimal 625 acre site with deepwater frontage to the Port of Brownsville shipping channel. The new site, located approximately 5 miles from the mouth of the Gulf of Mexico on the north side of the channel, facilitates construction, will allow safer reduced LNG tanker navigation within the channel, and allows the LNG project to plan for future expansion. Texas LNG’s equity and engineering partner, Samsung Engineering Co. Ltd, has assigned a large team of experienced engineers and project staff at its Global Engineering Center in Seoul, South Korea to lead the engineering phase of the project with support from its Houston-based North American Headquarters. As of the end of February 2015, Samsung Engineering had completed four months out of the 12 month Front End Engineering and Design (FEED) study and over 50 000 cumulative man-hours of engineering. In 2014, Samsung Engineering completed Concept Design and pre-FEED studies. Texas LNG is being supported by its owner’s engineer, Braemar Engineering, and environmental consultant, Natural Resource Group (NRG), to optimise public safety and minimise environmental impacts while complying with federal, state and local regulations. 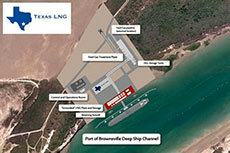 Texas LNG has appointed Braemar Engineering as Owner’s Engineers for the proposed Brownsville LNG project. Third Point LLC will provide development capital for Texas LNG Brownsville LLC’s LNG export project. 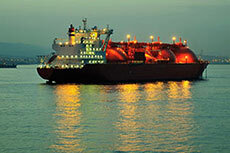 Texas LNG has received DOE approval to export to FTA countries and forms partnership with Samsung Engineering. The company has filed an application to the US DOE requesting permission to export LNG to global markets.